I’m posting excerpts from an article of mine published recently in China Daily. More and more firms from Asia are going global. According to United Nations data, between 2005 and 2006, China’s outward investment increased by 32 percent to $16 billion, one of the fastest. State-owned companies are responsible for the bulk of China’s overseas investments. But does this mean that smaller private companies are left out? No, foreign investment in most sectors shows a pattern: large investments by a few big firms, and numerous small investments by small firms. Small and mid-size companies have also been going global. Can smaller firms afford to neglect globalization? … Even those midsize firms that play exclusively in the domestic Chinese market need to develop an understanding of how the external economy impacts them. And their domestic strategies need to be renewed periodically in light of this understanding. This is becoming critical for success in highly competitive markets. The first part of this understanding relates to risk. Unlike many other governments, China has successfully cushioned the economy from external risks, a success that has earned it laurels since the Asian Financial Crisis in the late 1990s. But the global economy has evolved. Risks are increasingly intertwined; they now spread more rapidly from one region to another. Any government will find multiple risks, from oil prices to food inflation to political instability, harder to manage simultaneously. This environment is particularly threatening to midsize firms. The first part of their globalization strategy, therefore, should be informed by a strategic risk management approach. It requires a bit of research into understanding overall risks to the firm, the industry and the economy, the level of control over these risks, strategies to mitigate them, and implementing a flag-raising mechanism that kicks in toward suggesting alternative strategies when risks increase. Beyond risk, the global economy, of course, offers manifold economic opportunities. To maximize them, a midsize firm will once again need to put on its strategic hat. It will need to juggle multiple geographies and products, and understand and manage them on a timeline from present to future. But doing this successfully requires two fundamentals that mid-market firms in emerging economies cannot take for granted. The first is information [on how to go global] … While information sources are not available easily in the public domain, there are boutique firms that specialize on providing information on how to go global, from marketing and selling, to tax, laws, and regulations, to organizational structure and communication, to infrastructure needs, and to managing people. The second is a strategic mindset or capability. An example will make this clear. To make use of global opportunities, many firms decide to acquire another firm abroad. But acquisition is the easy part. Most firms struggle to manage the post-acquisition reality because they have either not thought through the strategies or neglected to build the capabilities ahead of time. And so, almost 70 percent of all mergers and acquisitions fail to deliver the intended results. Here, too, specialized consulting firms that focus on capacity development in a global context can help. Like it or not, the world economy is a reality even for domestic-focused firms, and the value of global information and strategy is something that mid-size firms can no longer afford to ignore. More than two-thirds of corporate CEOs are optimistic about globalization, believing that cross-border mergers, acquisitions, and business in general will keep on increasing through 2009. Imminent recession in the advanced industrial economies may even increase their spread abroad. Consider these growth projections made by IMF. In 2008 and 2009, the US economy will grow at most by 0.6 percent. China and India will register 9.5 and 8 percent respectively. If you wanted profits and growth, where would you rather be? Thus we have CEO optimism about globalization despite slowdown in the US. The problem is that politically there are reasons to be cautious. The past few months I have been highlighting what I consider the single biggest gathering risk to doing business across borders: political action. This has several aspects. First of all, voters in the West have become cautious about globalization and free markets. The 2007 Pew Global Attitudes Survey (PGAS), involving 45,000 people across 47 countries, reports that people have begun to take a more cautious approach to free markets, compared to 2002. US electoral rhetoric is adding fuel to their fear. 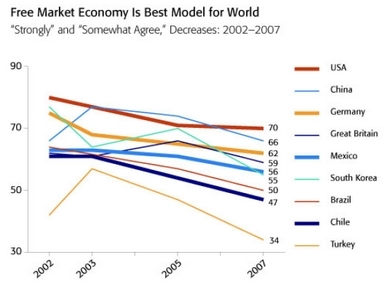 Support for globalization and capitalism have also been decreasing outside the West. The 2007 Globescan survey (see figure on the right) reports a downward trend in 10 of the 18 countries monitored regularly. And this survey was done before the current credit crisis hit the markets to further dampen mood. Moreover, people in every country surveyed in PGAS (2007) felt a strong need to protect their cultures from foreign influences. This means that globalization will become expensive, for foreign companies have to strive more, including greater product and service variation, to become accepted locally. My February post, “Enter a market (and be accepted)” talks more about this. Their fear is heightened by inequality, both real and perceived, which has been increasing across emerging markets. In places like India, mass voters have openly reviled conspicuous consumption by the elite. And foreign influence is seen as agents of this inequality. The global food crisis is compounding matters, and hunger-induced riots are threatening even pro-investment authoritarian governments. Not only are people becoming wary of foreign investors and traders, but they are expecting more politically from business firms. This expectation will only intensify through the Olympic Games and in the coming years. After criticism of China by the French government, the French supermarket chain Carrefour has been passing tense times, having unwittingly provoked both Chinese nationalists and European human rights activists. The norms of corporate governance are in a period of significant transition, as corporate political responsibility is being added on top of corporate social responsibility. Whether CEOs like it or not, business firms are political actors too, and ignoring this transition will heighten political risk. So business calculations that go into cross-border strategy need to expand far beyond the traditional financial and legal focus. They will have to become politically sophisticated, requiring careful analysis and political variables, and informed to a greater degree by local political realities. This coming recession will likely thrust a demand for greater political action on the part of globally expanding businesses.